Bright and sunny light yellow natural rough Sulphur in Quartz from San Felipe, Baja California Norte, Mexico. 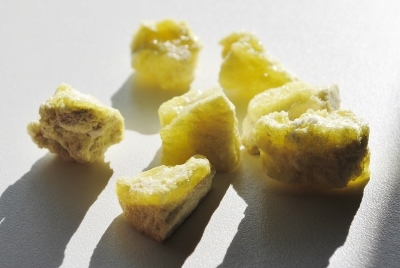 Sulphur mineral assists in removing negative thoughts and emotions. Sulphur was used by South American and Mexican Indians in ceremonial healing. 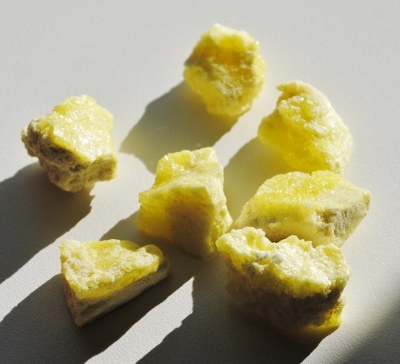 Sulphur facilitates the synthesis of the four directions, Mother Earth and Father Sky. 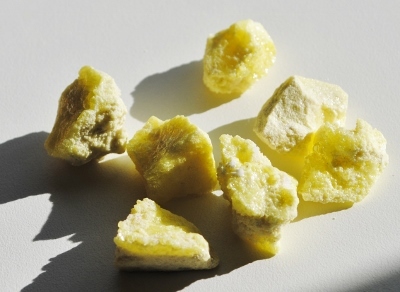 Sulphur was also used by the ancient nomadic tribes of North America as an offering to the four cardinal directions to dissipate darkness and cleansed corruption from the Earth. 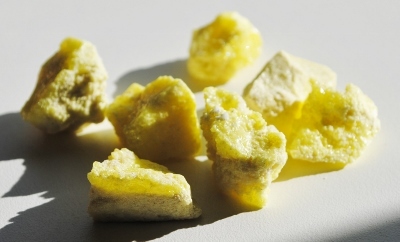 In healing, Sulphur may be used in the treatment of disorders related to infections within the body and in the elimination of fibrous and tissue growth. Quartz crystals raises energy to the highest possible level and works on all levels of being. Quartz crystal stores information like a natural computer. These crystals are a spiritual library waiting to be accessed and have the ability to dissolve karmic seeds. Quartz enhances psychic abilities and attunes you to your spiritual purpose. Quartz is a master healer and can be used for any condition. It stimulates the immune system and brings the body into balance. Quartz harmonizes all the chakras and aligns the subtle bodies.